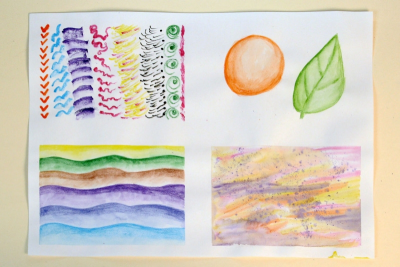 Students explore a variety of watercolour techniques using watercolour pencils. 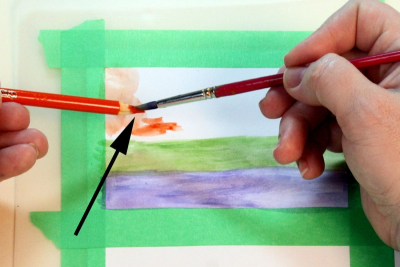 Tape a single piece of watercolour paper to a plastic placemat or piece of stiff cardboard. 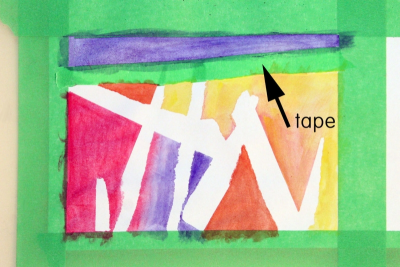 Use masking tape to divide the paper into 4 sections. When the tape is removed it will leave a white border around the paintings. Be sure to use one long strip of tape for each side unless you want a broken border. Do not wet the paper before starting. Dip a pencil into water and then draw on the paper. Repeat the lines to create interesting patterns. Imagine how you might use these lines, and or patterns in a picture. Draw some geometric and organic shapes with a pencil. Colour around the inside edges of the shape with a dry pencil. 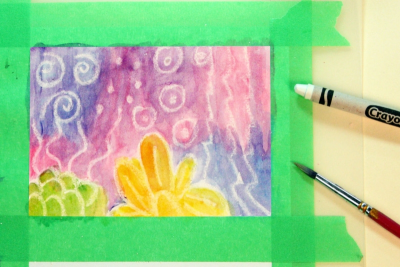 Experiment with how much colour and water you use to get a 3-dimensional effect. 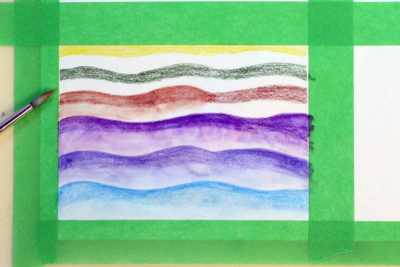 Draw some wavy, horizontal lines across the paper. Colour along the edges of the lines with a dry pencil. Use a wet paintbrush to wet the colour and spread it out to the next line so it goes from dark to light. Wet the entire paper with clear water. Wet a paintbrush and paint it across the tip of a pencil to pick up colour. Paint into the wet paper. Repeat this process until the paper is filled with colour. 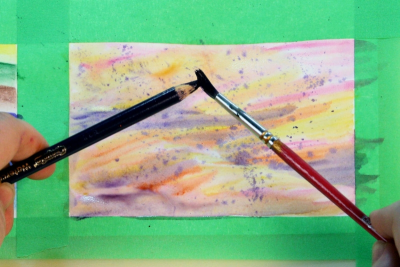 Push the wet paintbrush against the tip of the pencil to create splatters. Paint on the dry paper until it is filled with colour. Compare this painting with the wet paper painting. Imagine how you might use these techniques in a picture. Stick small pieces of tape to the paper before painting. Paint on the paper until it is filled with colour. Go right over the tape. Allow the paint to dry and then gently remove the tape. Imagine what the white shapes might be. Add details or leave the shapes as they are. Use crayons to draw a design on the paper. Press hard while colouring. Leave lots of the paper uncoloured. Paint over the crayon drawing letting different colours blend together. Colour a variety of colours (or just one) directly on the paper with a dry pencil. Paint over the first layer of colour until the paper is filled with strong colour. Paint over the dry paint with contrasting colours. Choose 3 of the 8 techniques to discuss with a partner. - Why did you choose these techniques? - How would you use these techniques in a picture? - What did you like best about using watercolour pencils? focus on the use of blending to create a sense of deep space. Download the Colour poster available on this website. Place students in groups so they can share ideas. Provide paper towel, masking tape, water containers and small paintbrushes for each student/group. View and discuss several of the watercolour images. - Ask students to guess how they think the artists went about painting their pictures. - Explain that watercolour paints are transparent and they can be used in a variety of ways. - Point out parts of the paintings that have very light, transparent colour; textured lines and shapes; interesting textures; strong colours. 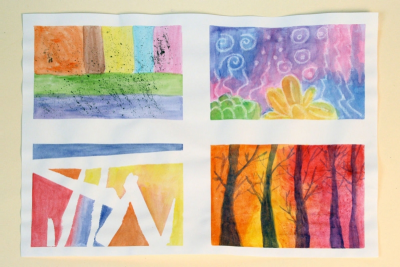 Ask students to share what they know about using watercolour paints. Explain that watercolour pencils are like two things in one – a coloured pencil, and watercolour paint. Explain that today's class is for experimenting with different techniques. It's a time to play with ideas and see what happens. 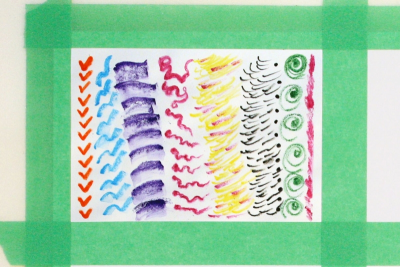 Create 6 different marks with wet watercolour pencils. 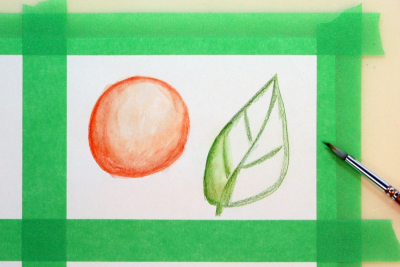 Use 8 different techniques to create a variety of effects with watercolour pencils. Build on your own and others’ discoveries to generate new ideas. 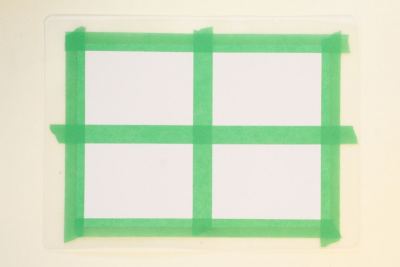 Demonstrate how to tape the paper to the plastic mat. Remind students that they will need to clean their water once it gets dirty, because the dirty water will muddy their colours. Once most students have completed their first 4 experiments stop the class and invite students do a walk about to see what others have done. Encourage them to think of new ways to use each technique. - Compare their work and describe to each other something they find interesting and why. - Discuss the things that are especially effective and why. - Discuss how they might use these techniques in a painting. Observe students as they discuss the experiments – active listening, insightful contributions, supporting ideas with evidence found in the artwork and from personal experience. 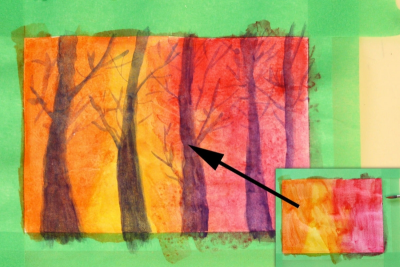 Have students label each technique and write a brief statement explaining how they might use the technique in an artwork.